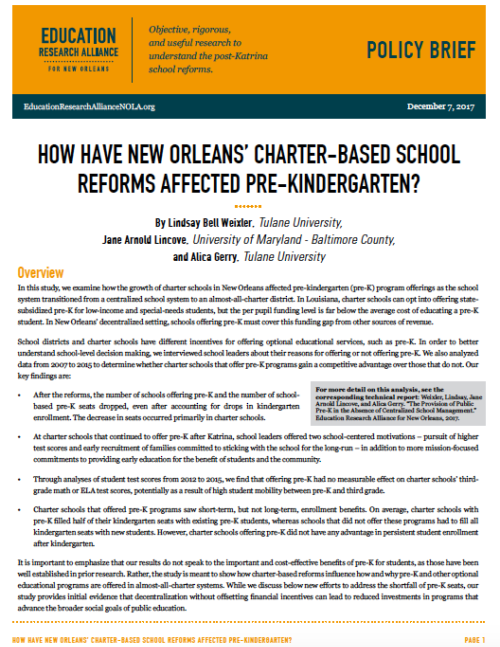 A policy brief by Lindsay Bell Weixler, Jane Arnold Lincove, and Alica Gerry on how the growth of charter schools in New Orleans affected pre-kindergarten (pre-K) program offerings. In this study, we examine how the growth of charter schools in New Orleans affected pre-kindergarten (pre-K) program offerings as the school system transitioned from a centralized school system to an almost-all-charter district. In Louisiana, charter schools can opt into offering state subsidized pre-K for low-income and special-needs students, but the per pupil funding level is far below the average cost of educating a pre-K student. In New Orleans’ decentralized setting, schools offering pre-K must cover this funding gap from other sources of revenue. After the reforms, the number of schools offering pre-K and the number of school-based pre-K seats dropped, even after accounting for drops in kindergarten enrollment. The decrease in seats occurred primarily in charter schools. At charter schools that continued to offer pre-K after Katrina, school leaders offered two school-centered motivations – pursuit of higher test scores and early recruitment of families committed to sticking with the school for the long-run – in addition to more mission-focused commitments to providing early education for the benefit of students and the community. Through analyses of student test scores from 2012 to 2015, we find that offering pre-K had no measurable effect on charter schools’ third grade math or ELA test scores, potentially as a result of high student mobility between pre-K and third grade. Charter schools that offered pre-K programs saw short-term, but not long-term, enrollment benefits. On average, charter schools with pre-K filled half of their kindergarten seats with existing pre-K students, whereas schools that did not offer these programs had to fill all kindergarten seats with new students. However, charter schools offering pre-K did not have any advantage in persistent student enrollment after kindergarten. It is important to emphasize that our results do not speak to the important and cost-effective benefits of pre-K for students, as those have been well established in prior research. Rather, the study is meant to show how charter-based reforms influence how and why pre-K and other optional educational programs are offered in almost-all-charter systems. While we discuss below new efforts to address the shortfall of pre-K seats, our study provides initial evidence that decentralization without offsetting financial incentives can lead to reduced investments in programs that advance the broader social goals of public education.